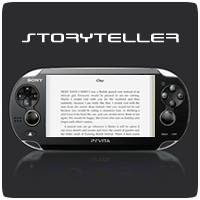 According to a report from MCV, Sony are planning to spend some of their E3 press conference discussing a upcoming service called Storyteller, an eBook and interactive document system for both PS3 and PS Vita. The service will appear on the PSN Store alongside Games and Movies, much like how the PSP Comic service appeared on the PlayStation Store in the past. As usual, Sony hasn’t confirmed the store, but it could be an attempt to compete with the likes of Amazon’s Kindle and Apple’s iPad, both of which are better suited to reading books.